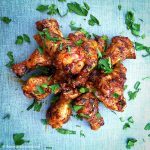 To ensure this is the best BBQ chicken you have ever had, we are going to marinate the chicken for hours in this awesome spicy smokey citrusy marinade. Today I am using quicken quarters. I love using chicken quarters because I feel like they retain more juiciness than legs and thighs by themselves. Feel free to use your favorite cuts of bone-in chicken. This marinade is good for about 4 lbs of chicken. Double the recipe if needed. Combine all ingredients and blend in a food processor, blender, or using a hand blender. I use this hand blender a lot for recipes like this. 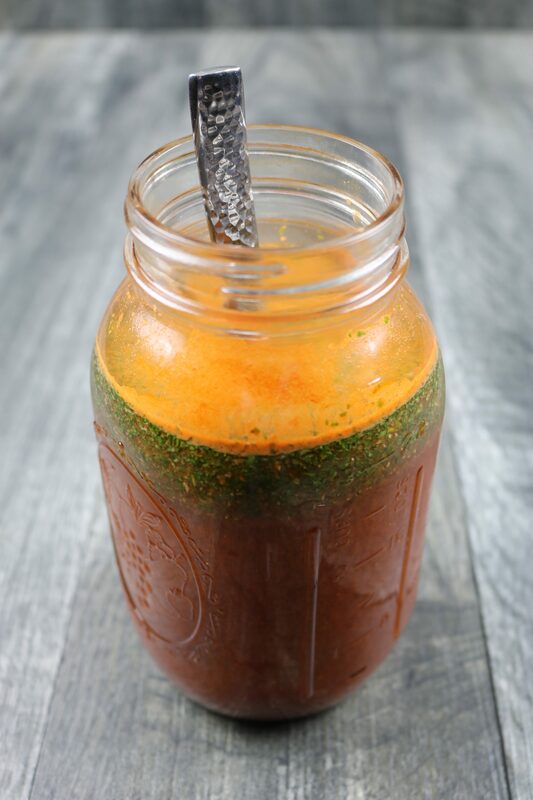 It fits inside a wide mouth mason jar, so you can blend marinades and then store them easily if needed. Add the chicken to large gallon sized ziploc bags with the marinade and marinate for at least 2 hours, preferably for 6 hrs or more. Overnight should work fine too. 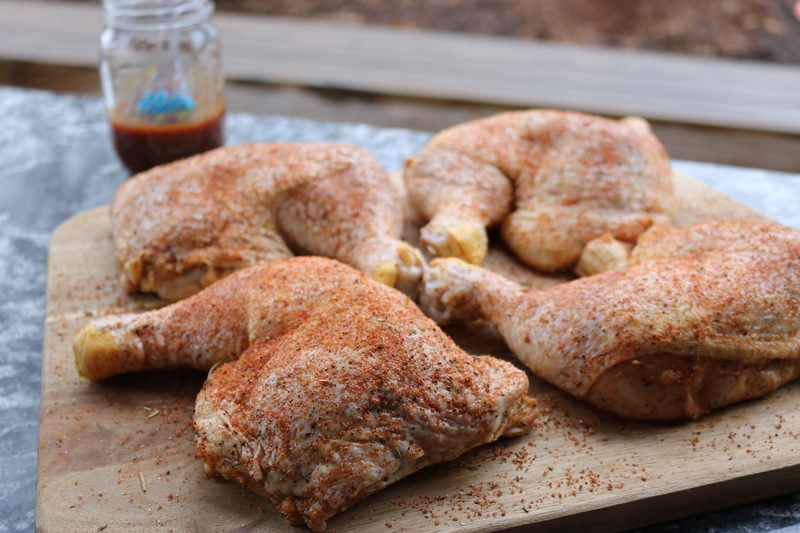 Now that you have marinated your BBQ Chicken for hours, it is time to add the next layer of flavor with a salty sweet BBQ rub that is good on about everything…. including this chicken recipe. 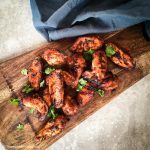 If you are a regular at Seared & Smoked, then you have probably used this recipe before. I call it my Good Lov’n Rub… cause its good on everything. Make a jar of this and use it on any chicken or pork recipe. Mix everything together. Take the chicken out of the marinade and give it a quick rinse under cold water. Then pat the chicken dry. After the chicken is nice and dry, coat the chicken with a nice even coating of the BBQ Rub. If you have time, place the chicken on a pan uncovered in the fridge for 2 hours. This helps promote crispy chicken skin. If you don’t have time, don’t worry about. 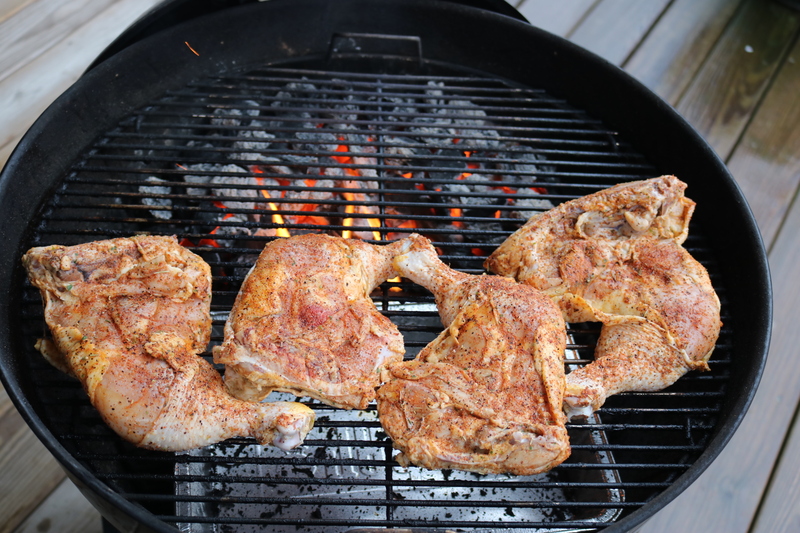 My favorite way to make any bone-in chicken is to grill it over indirect heat for about 1 hour at 350 F, then finish the chicken over medium to high heat to char the chicken. This BBQ chicken is no different. I am going to use the Webber Kettle to cook the chicken at 350 F, then finish it off on my Weber Genesis to char the chicken with the BBQ Sauce. To setup the weber, pile up lump charcoal on one side and start about one pound of charcoal in a chimney starter. My favorite fire starter for chimney starters is the tumbleweed fire starter. 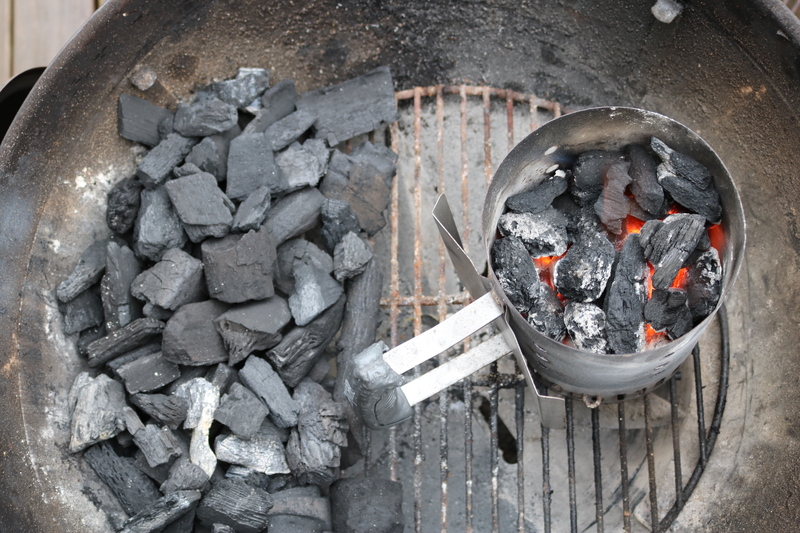 Start the charcoal and place that on top of your lump charcoal evenly. 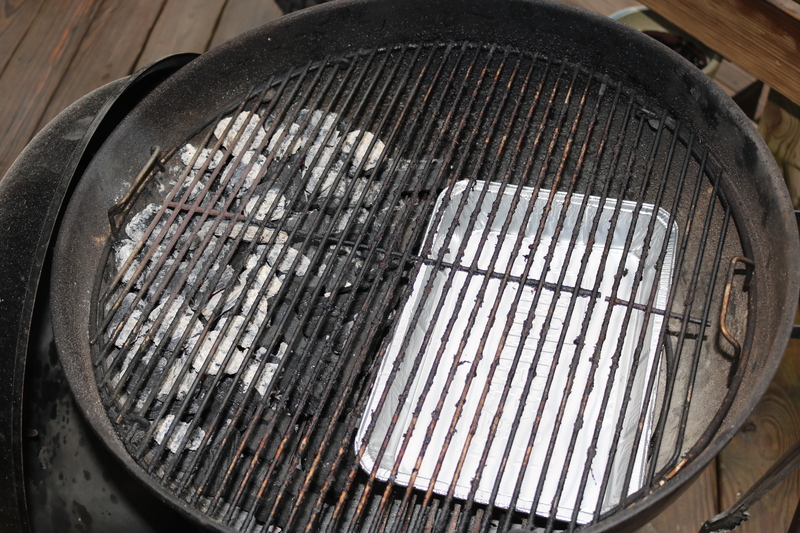 Then add a foil drip pan below and put the grate back in place. After the grate is back in place, put the lid back on and open the top. Open the top vent half way and the bottom vent 1/2 way for 15 minutes then close the bottom to 1/4 open. Then let it heat up for another 15 minutes or longer. Shoot for 350-400 degrees F. Open both vents slightly to increase temperature or close both to decrease temperature. 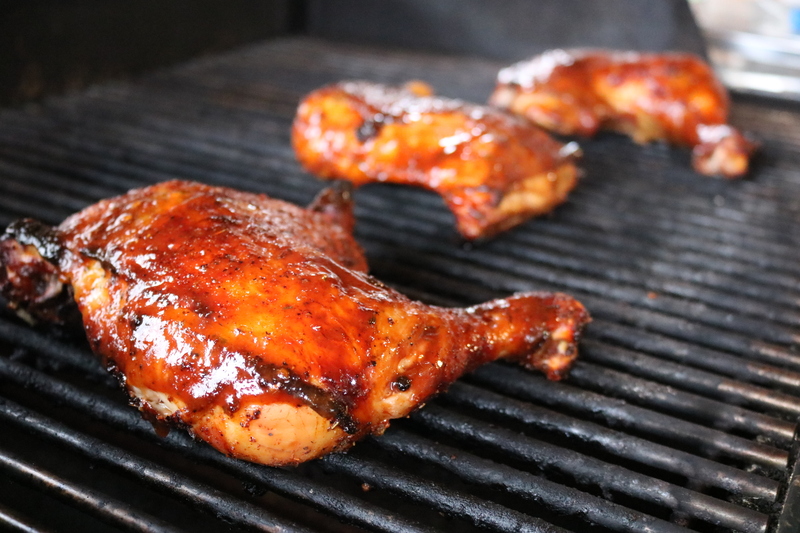 Before we finish grilling, we need a tasty BBQ sauce for our chicken. Pick out your favorite sweet sauce or make my favorite homemade BBQ Sauce. You will love this, and it only takes about 1 hour to make. Great for all BBQ occasions. I would call this a Kansas City BBQ sauce, with its signature sweetness. I love this all cuts of Pork and Chicken. 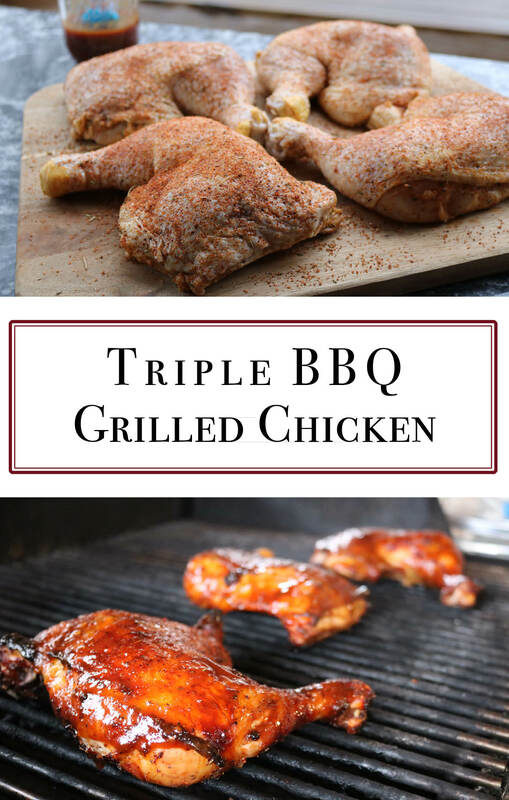 Great on pulled pork sandwiches, ribs, and as a finishing sauce on BBQ chicken. Ok, so now that you have your sauce, grill your chicken over indirect heat for about 1 hour. Start with the skin side down for the first 30 minutes, then flip and finish with the skin side up. How do you know when the BBQ Chicken is done? I monitor the skin color and texture when it is grilling over the indirect heat. 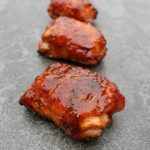 When it starts to turn golden brown or a little darker and it feels a little crispy to the touch, it is probably time to finish over high heat and glaze with BBQ Sauce. Check the internal temperature of the chicken if you are not sure. If the BBQ chicken is above 155 F and the skin is getting crispy, then you are ready to finish over high heat. 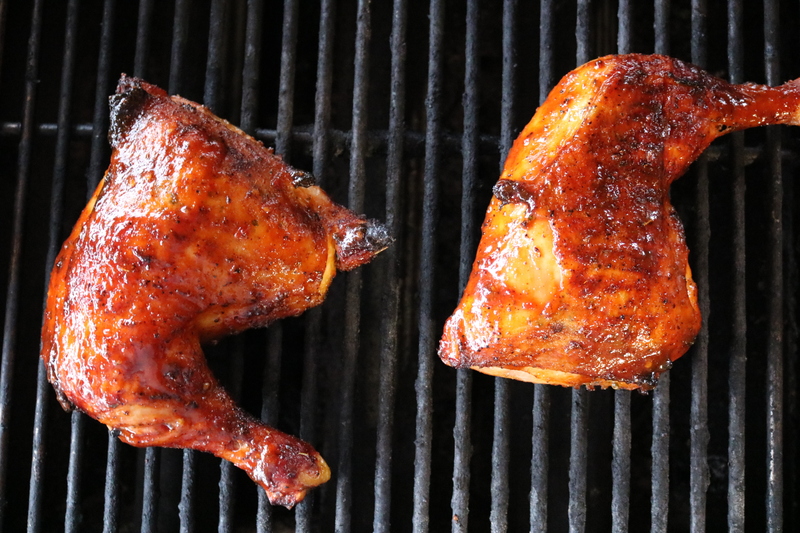 When finishing over high heat, glaze the chicken and turn the chicken every 1-2 minutes. You want to char the chicken, but not burn the hell out of it! This really depends on how hot your grill is. That is why I find using a gas grill to finish the chicken much easier than over charcoal. 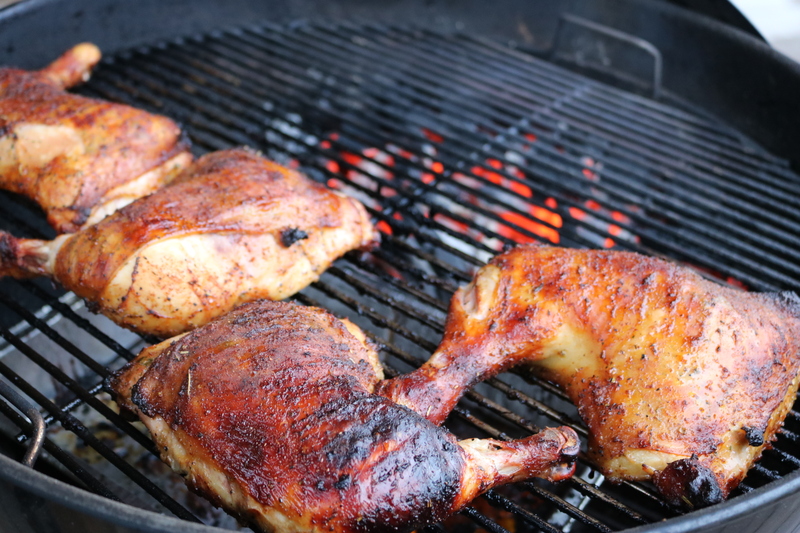 You can definitely do this over charcoal, you just have to keep the chicken moving faster, flipping more often. Glaze and flip the chicken for a total of 6-10 minutes and you are ready to eat! I hope you enjoy this recipe…. I think it has the most amazing flavor with the tree steps to ensure flavor is packed into every bite!